The Takings Coalition can hold together as long as there is more money flowing into the state to finance the demands of each constituent group. Higher taxes can give more money to the government workers; keep the big-city political machines financed; send more government grant money to the universities and the “nonprofit sector; and fund the coercive utopians. The Takings Coalition thrives when the government is growing in resources and power. The coalition holds together when the scene looks like the par of the movie after the bank robbery where the robbers meet around a table and the boss divvies up the loot. But when the Leave Us Alone Coalition succeeds in cutting off the flow of tax dollars, where we put our foot on the air hose, when we say “no new taxes” and mean it, then those sitting around the Takings Coalition table see that there is not enough money for everyone in the gang. At that point the assembled members of the Takings Coalition begin to look like the scene in the lifeboat movie where everyone must decide whom to eat or throw overboard. This is when we clearly see that the left is not made up of friends and allies. They are competing parasites. If we refuse to send them even more of our tax dollars, they will gnaw on each other. At the moment, the hawks are at a clear disadvantage. From Rand Paul to Grover Norquist, there’s a broad constituency within the conservative movement for shrinking the national security state, either as a compromise necessary to keep domestic spending low or as an end unto itself. But there’s no mirror-image constituency among hawks for raising tax revenue for the sake of maintaining the Pax Americana. I’m pretty sure that Bill Kristol or Charles Krauthammer would vastly prefer, say, capping the home mortgage tax deduction or closing the carried-interest loophole for hedge funds to making “massive cuts in the defense budget.” (And I bet that the great neoconservative hope, Marco Rubio, would as well.) Yet the Weekly Standard took the same line on the debt ceiling negotiations that other conservative outlets did: No revenue increases, no grand bargain, etc. The result? The result, at the risk of spoiling your enjoyment, is that Kristol is not happy. Quite the turn of events. Here was Kristol, loyally serving the party for years on end, including its monomaniacal hatred of taxes, in the belief that this would give him a veto in the one corner of policy he actually cares about, defense and foreign affairs. Kristol was happily chortling along with the party's plan to hold the entire economy hostage to its demands to slash spending and hold revenue low, confident all along that this couldn't impact the $700 billion a year we spend on defense. And then, wham, before he knew what was happening, the hostage was out of the closet he was helping guard, and he was standing in his place with duct tape around his wrists. Funny how that works. Hospitals have already started running ads on cable television protesting the potential cuts, under the banner of a group called The Coalition To Protect America’s Health Care. But simply advocating against cuts will not be enough. Like defense contractors, they are the hostages now, and they must advocate for Democrats and Republicans to come together on a final deal in the fall, before the trigger gets pulled. 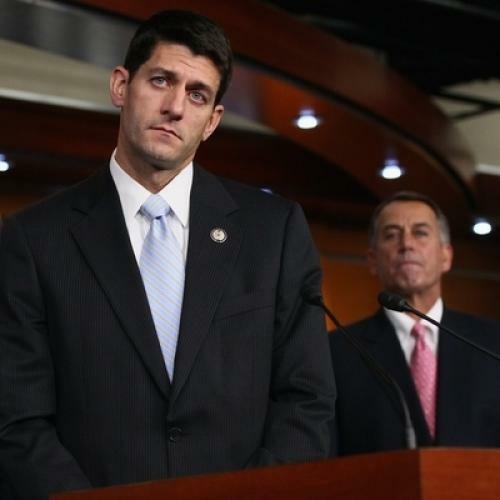 In the deficit debate, Congress has proved itself inept at fighting for the common interest. In turning the gun on special interests, they are essentially outsourcing that job to Washington’s most effective actors. I actually think the design of this plan is fascinating. You take a couple of the most powerful forces preventing major policy change -- partisan gridlock and special interest influence -- and turn them into forces for change by rejiggering the default setting. It's going to get interesting. Liberals widely assume they'll just get rolled once again, as Republicans will insist on zero revenue, and Democrats will cave. I'm not so sure. For one thing, the trigger really is finally balanced. Last December, inaction on taxes meant an economy-crushing tax hike at a really bad time for Democrats. This summer, inaction on the debt ceiling meant economic cataclysm at an even worse time, the cost of which would mostly be born by President Obama. But the inaction trigger in the fall will be something genuinely painful to both parties. The anti-tax movement has held absolute sway within the GOP for two decades. But it's worth noting that the GOP has never had to choose among its constituencies in a zero-sum fiscal environment before. The policy of huge tax cuts and big defense spending hikes could coexist as long as Republicans could just run up the budget deficit. The party refused to reconcile its contradictions by refusing to acknowledge fiscal reality. Higher revenue to pay for the wars? Reagan proved deficits don't matter. It's easy to hold all your factions together when you refusing to acknowledge basic accounting properties (deficits equal expenditures minus revenue, not just "too much" expenditures by definition.) George W. Bush made the defense hawks happy, made the medical industry happy with a prescription drug bill designed to maximize their profits, and made rich people in general happy with a series of regressive tax cuts. But imagine Democrats insist on higher revenue, and they decide, sensibly enough, that failure to cut a bipartisan deal is better than $1.8 trillion in cuts. (Which is probably is.) Then what? Well, then the entire defense lobby plus the entire medical and insurance lobbies turn fiercely against the very people with whom they had marched shoulder-to-shoulder under Bush. If the Democrats hold the line and insist on more revenue, the committee has the potential to split the GOP coalition wide open. GOP leaders Mitch McConnell and John Boehner have to be especially careful in their choice of appointees. No one from the Senate Gang of Six, who proposed tax increases, need apply. The GOP choices should start with Arizona Senator Jon Kyl and House Budget Chairman Paul Ryan, adding four others who will follow their lead. Well, they can try. But it's not like the Gang of Six was filled with tax hikers, either. The simple fact is that trying to formulate rationale answers to the fiscal challenge without raising revenue is essentially impossible. The Journal no doubt hopes the Republicans follow the traditional course -- the course that has held the party together since 1990 -- of simply ignoring reality. The difference is that this time, reality will be knocking urgently on the door.